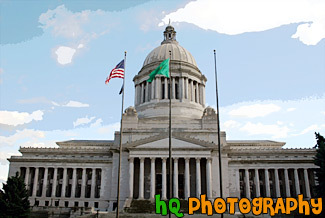 A scenic picture taken of the Washington State Capitol Building located in state capital city, Olympia on a partly cloudy day. This capitol building was first occupied by the Legislature in March, 1927. The design is reminiscent of the Acropolis in Athens, Greece. 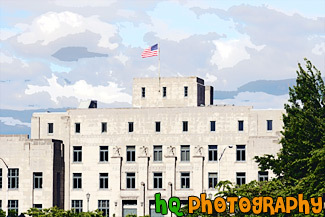 It is also closest in design to the U.S. Capitol in Washington, D.C. The building was constructed between 1912 and 1928. It is unique among state capitols in that instead of one large building, it consists of four separate buildings; the domed structure is the Legislative Building. The 287-foot high dome is the fourth tallest all-masonry dome in the world. 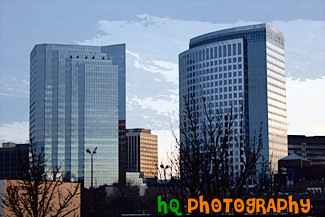 A scenic picture taken of two of the buildings located in downtown Bellevue, Washington. 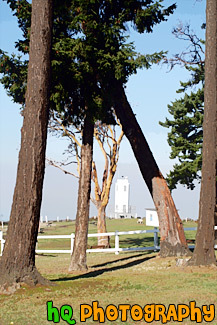 A scenic picture taken of the Brown's Point lighthouse located across Commencement Bay near Tacoma, Washington. Browns Point is situated on the eastern side of the entrance to Commencement Bay, which leads from Puget Sound to the port of Tacoma. The Brown's Point lighthouse is located in Browns Point Lighthouse Park lies on the tip of historic Browns Point, and provides the community waterfront access, enticing beachcombers year round and sunbathers and picnickers during the summer. 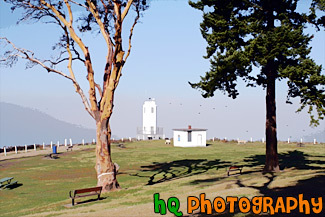 A scenic picture taken of the Brown's Point lighthouse with fog seen over the Commencement Bay in the distance and birds flying in front of the lighthouse. The Brown's Point lighthouse is located in Browns Point Lighthouse Park lies on the tip of historic Browns Point, and provides the community waterfront access, enticing beachcombers year round and sunbathers and picnickers during the summer. 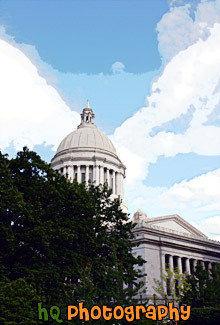 A scenic vertical picture taken of the Washington State Capitol Building with a tree in front and interesting clouds in the sky. This capitol building was first occupied by the Legislature in March, 1927. The design is reminiscent of the Acropolis in Athens, Greece. It is also closest in design to the U.S. Capitol in Washington, D.C. The building was constructed between 1912 and 1928. It is unique among state capitols in that instead of one large building, it consists of four separate buildings; the domed structure is the Legislative Building. The 287-foot high dome is the fourth tallest all-masonry dome in the world. 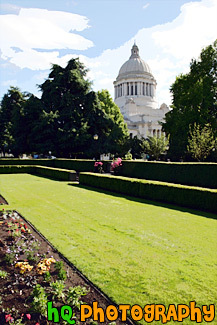 A scenic picture taken of the Washington State Capitol Building which is seen off to the right with a garden and flowers seen in the foreground, and the Insurance building and statue in background. 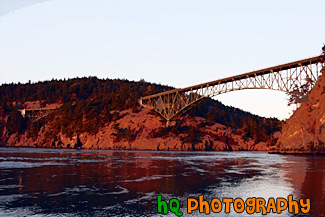 This picture was taken on a beautiful blue sky summer day in Washington State. 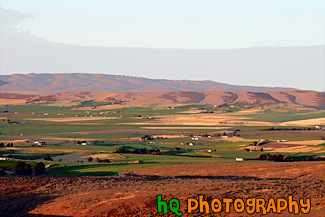 A scenic picture taken during dusk of the country land of Ellensburg which is located in Eastern Washington State. In the background you can see some windmills on the hill generating electricity. 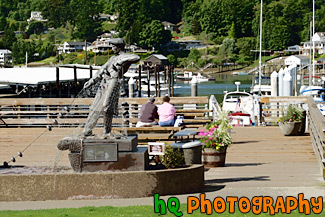 A scenic picture taken of an older couple enjoying the nice day seen in Gig Harbor, Washington on this beautiful summer day. 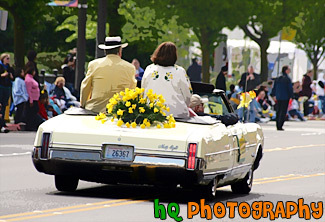 A scenic picture taken of the back of an old car and an older couple riding down Pacific Avenue during the 2006 annual Tacoma Daffodil Parade. This is a light yellow car with a boquet of yellow daffodils seen on the back of the car. 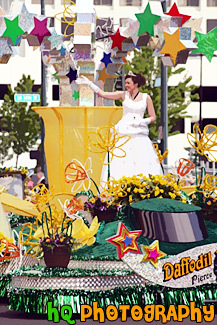 A scenic picture taken of a lady in a white dress on a decorated float at the annual Daffodil Parade in Downtown Tacoma, Washington. The parade takes place on Pacific Avenue. 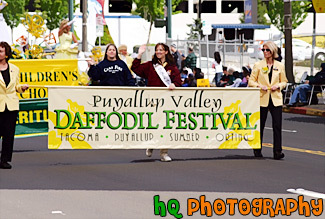 A scenic picture taken of people holding the Daffodil Parade sign while walking down Pacific Avenue in Tacoma, Washington. This parade also takes place in Sumner, Puyallup, and Orting. 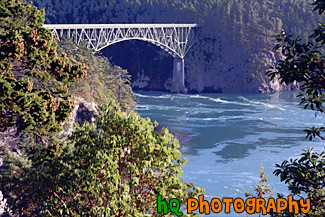 A scenic picture taken of the Deception Pass bridge looking through trees. 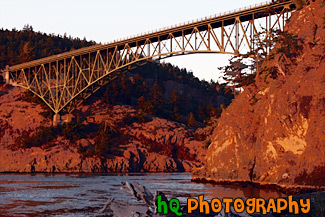 The Deception Pass Bridge connects Whidbey Island to Fidalgo Island in the U.S. state of Washington. 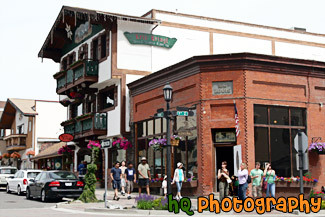 A scenic picture taken of downtown Leavenworth, Washington with people standing outside on the street corner. A scenic vertical picture taken of the Bavarian shops and a big mountain in the background. 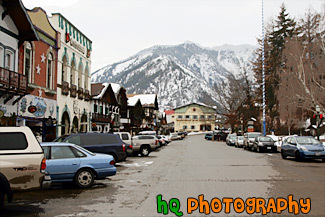 A scenic picture taken of downtown Leavenworth, Washington during a winter afternoon. Leavenworth is a tourist town located in Eastern Washington and is close to Steven's Pass. 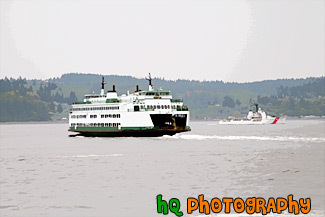 A scenic picture taken of a Washington State ferry boat transferring cars across the sound near Mukilteo. This picture was taken on a cloudy spring day. 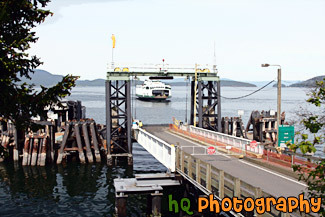 A scenic picture taken of a ferry docking along the coast of Friday Harbor which is located on the San Juan Island in Washington State. This photo was taken on a sunny day. 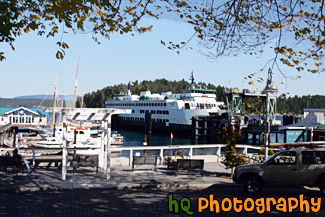 A scenic picture pulling into the Friday Harbor ferry docking station which is located on the San Juan Islands in Washington State. 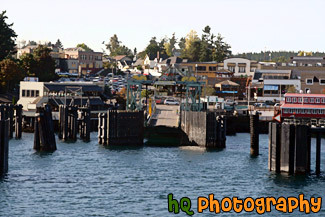 A scenic picture taken of Gig Harbor, Washington located downtown by the harbor. 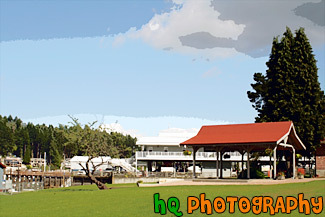 This photo was taken on a beautiful sunny day with blue skies all around. 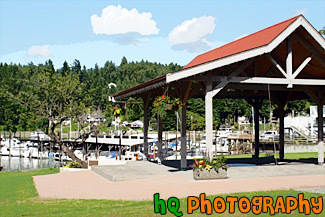 A scenic picture located in downtown Gig Harbor, Washington on a beautiful blue sky, sunny day. 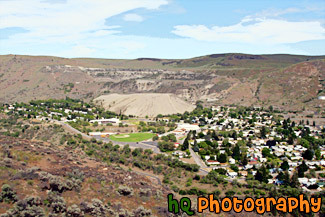 A scenic picture taken of the city of Grand Coulee located in Eastern Washington State. 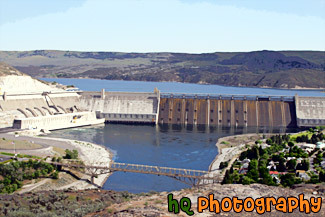 A scenic picture taken of the Grand Coulee Dam located in Eastern Washington State. 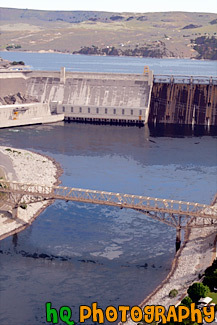 A scenic vertical picture taken of the Grand Coulee Dam which is located in Eastern Washigton. The Grand Coulee Dam creates the Lake Roosevelt lake which is the largest lake in Washington and is over 150 miles long with some really great beaches. 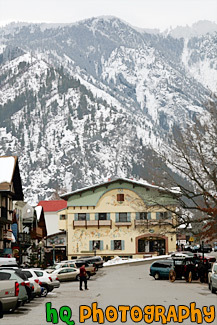 A scenic vertical picture taken of Hotel Europa located in Leavenworth, Washington. 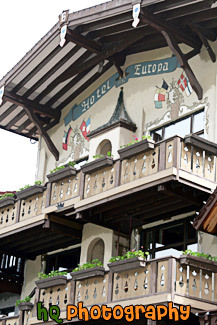 This is a Bavarian themed hotel. A scenic picture looking up stairs to the Washington state Insurance Building and statue located on the grounds of the Capitol Building. This picture was taken on a sunny summer day. 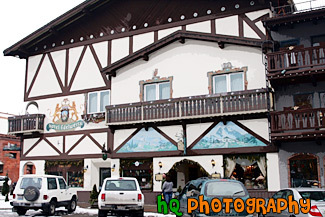 A scenic close up picture taken of a Leavenworth Bavarian hotel located in downtown. 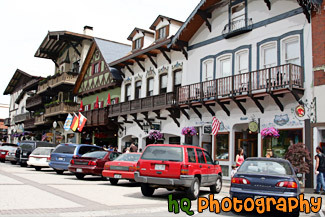 A scenic picture taken of downtown Leavenworth and some of the Bavarian shops. A scenic picture taken of two benches sitting against the wall with some Bavarian artwork decorated on it in Leavenworth, Washington. 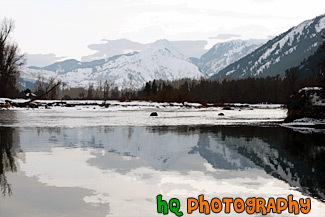 A scenic picture taken of the mountains and reflection in Leavenworth, Washington during the winter season as you can see snow covered on the mountains. 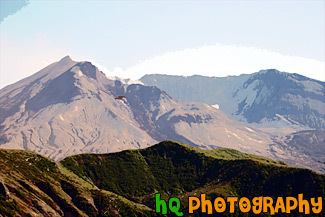 A scenic close up picture taken of Mount St. Helens volcano with a bird flying in front. This picture was taken at the Windy Ridge view point. Hence the name, it is really windy here and this bird was taking advantage as he was gliding through the air effortlessly. Mount St. Helens is located in Gifford Pinchot National Forest and is a popular landmark of Washington State. This is a beautiful scenic photo of Mt. Rainier taken during the beginning of June. This photo was taken near Paradise in Mt. Rainier's National Forest. "The Mountain", as it's known by locals, draws your eyes like a magnet when it is visible instead of invisible behind thick clouds. 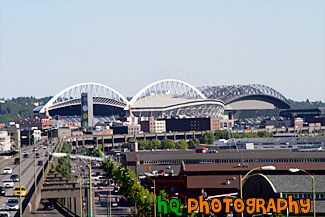 On clear days, Mount Rainier dominates the Seattle - Tacoma skyline, towering over the metropolis in breathtaking beauty. 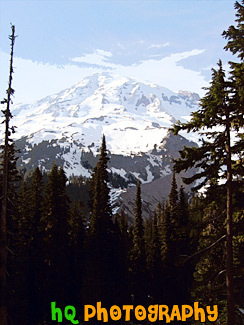 Mount Rainier's highest elevation is 14,410 feet which is located at the summit, also called Columbia Crest. There are 5 glaciers on the mountain: Nisqually, Cowlitz, White, Carbon, and Puyallup. A scenic picture taken of Mt. 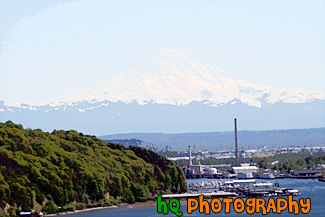 Rainier on a sunny blue sky day taken from the North Tacoma area. 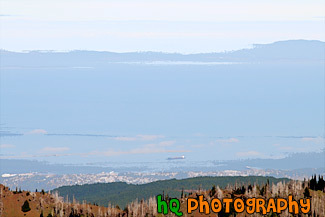 You can see part of Commencement Bay in this photo. 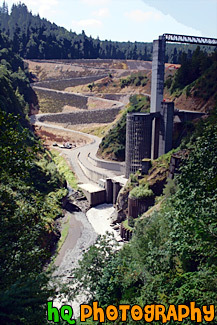 A scenic picture taken on Mud Mountain Dam which is located in the Cascade Mountains. Mud Mountain Dam is a U.S. Army Corps of Engineers flood control dam and recreation facility on the White River near Mt. Rainier in Washington State. Visitors to the facility can view the dam, picnic, hike, bike or ride their horses in a scenic woodland setting. 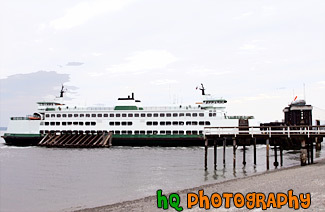 A scenic picture taken of a Mukilteo ferry boat loading up cars at the shore. 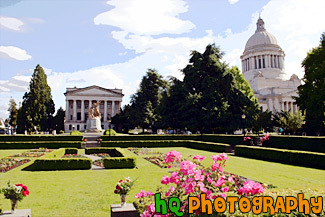 A close up picture taken of the Old Thurston County Court House building located in the state capitol of Washington State, Olympia. 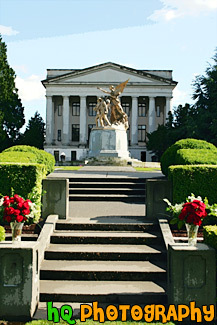 Thurston County built this sober gray courthouse in 1930, directly across the street from the state's new Capitol Campus. The plain, smooth face of Wohleb's courthouse boasts little decoration beyond a few bands of low-relief carving and four imperious eagles perched above the front doors. Its stepped-back upper floor, with smaller windows, was once the county jail. For almost half a century this courthouse was the focus of county government. It was where County Commissioners tended to business, where votes were tallied on election night and where couples came for their marriage license. 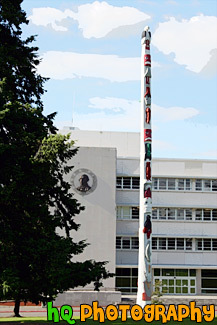 When Thurston County outgrew this space and moved to a larger courthouse complex in 1977, the old gray sandstone building was slated for demolition. It was saved through a groundswell of public support, but sat vacant for more than a decade before it was finally restored and reopened as mixed-use office space. The south courtroom now houses the law library of the State Attorney General's Office. The building is open to the public. 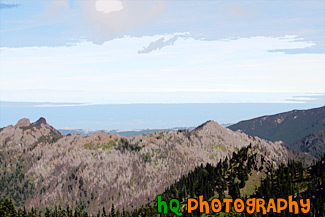 A scenic picture taken of the Olympic Peninsula and the Strait of Juan de Fuca. This photo was taken on a trail up near Hurricane Ridge located in the Olympic Mountains. 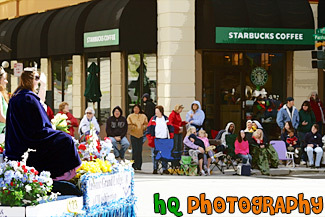 A scenic picture taken of a float and spectators watching a parade outside of a Starbucks store. This photo was taken at the annual Daffodil parade located in downtown Tacoma, Washington on Pacific Avenue. 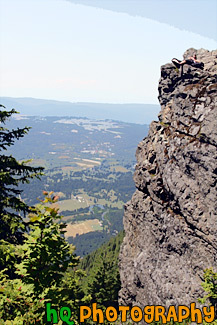 A view of the Seattle area and a rock cliff with a person laying on it from the top of Mt. 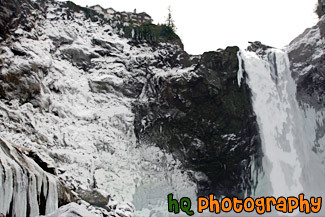 Si which is located in North Bend, Washington. 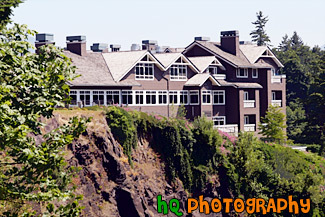 A scenic picture taken of the Salish Lodge & Spa located at Snoqualmie Falls, Washington. The Salish Lodge is 30 miles from Seattle and an elegant escape nestled in nature features all the finest amenities of a luxury hotel. This picture was taken just before the annual 2006 Daffodil Parade took place in downtown Tacoma, Washington on Pacific Avenue. 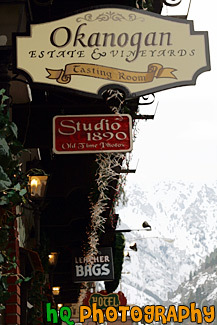 A scenic vertical picture taken of some of the shop signs in a row in downtown Leavenworth, Washington. You can see some of the mountains that surround Leavenworth in the background. 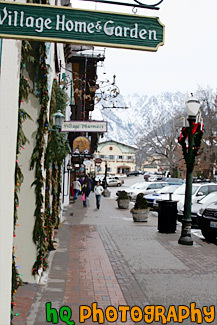 A scenic vertical picture taken of the side walk and some shops located in the small tourist town of Leavenworth, Washignton. You can see some people in the distance walking on the side walk. 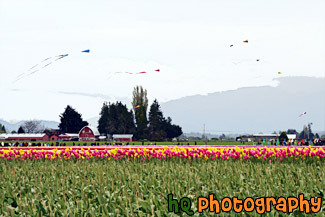 A scenic picture taken of the Skagit Valley Tulip Festival with rows of colorful tulips, kites flying above, and lots of people exploring the tulips. 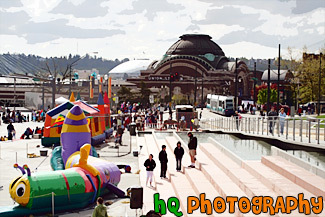 This festival is located north of Seattle, Washington in Mount Vernon. 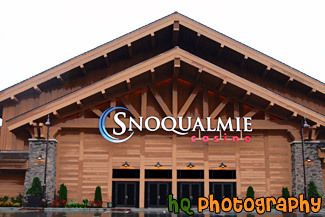 A close up photo taken of part of the new Snoqualmie Casino building located in Snoqualmie, Washington State. A scenic picture taken of the Strait of Juan de Fuca which provides part of the international boundary between the United States and Canada. This photo was taken on a trail up near Hurricane Ridge located in the Olympic Mountains. 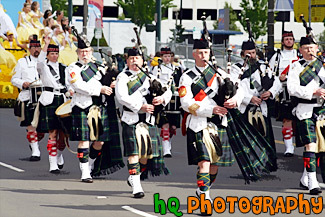 A scenic picture taken of bagpipe players during the annual 2006 downtown Tacoma Daffodil Parade located on Pacific Avenue. 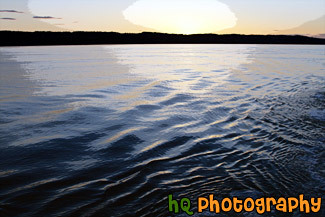 A scenic picture taken of the sun setting over Whidbey Island as you can see the island is a silhouette. 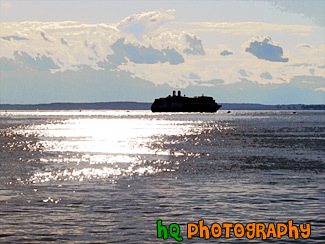 This photo was taken while on the Mukilteo ferry looking back at Whidbey Island.